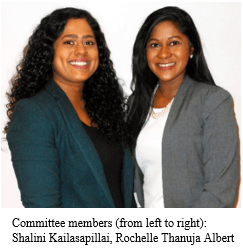 As first and second-generation Tamil Canadians, there has never been a greater time to declare an appreciation for the continuous involvement that the Tamil Community has chosen to uphold within our current society. From enduring war-stricken environments back home, to integrating families into a new country and culture, our elders have never hesitated to remind us of the importance of maintaining our culture and connection with our own community. ‘Tamils helping Tamils’ is a mantra that many organizations within our community have chosen to adopt in order to cultivate, connect, and aid Tamil professionals navigating the rocky waters of the corporate landscape, in a home away from home. 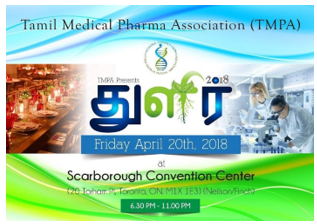 One such organization new to the community is the Tamil Medical Pharmaceutical Association or TMPA. 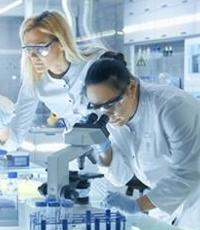 TMPA is a Canadian-based non-profit organization comprised of experienced and skilled professionals from large corporations from pharmaceutical, medical device, and bioscience industries such as Health Canada, Purdue Pharma, Patheon Inc., Apotex, and St. Michael’s Hospital, to name a few. Having worked in the industry for many years, the team identified a need within the Tamil community for a forum to network. In today’s corporate world, hard work alone is not sufficient to succeed. Having a strong network also plays a crucial role in career advancement. The TMPA team recognized that a strong Tamil networking forum can create endless benefits for its members. The team also identified the need for mentorship to recent graduates of the industry to expose them to the opportunities available to them. The fundamentals of TMPA are identified in its logo: “Network, Connect and Grow”. The organization will focus on goals such as providing a networking platform to the community, creating programs and events that will facilitate knowledge transfer from experienced professionals to young enthusiastic individuals and showcasing the success stories of Tamil Professionals in order to motivate TMPA members to reach their full capacity professionally. 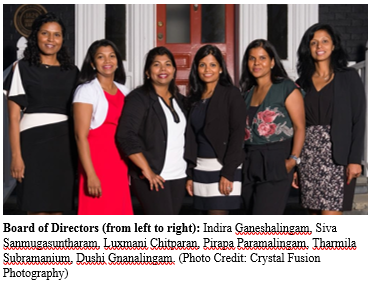 “Our vision is to create a platform for Tamils to maximize the potential of social networking professionally, and to become a central hub that provides resources, guidance, tools and support to Tamil professionals to navigate and succeed within the industry,” says Luxmani Chitparan, president and founder of TMPA. TMPA’s goal is to provide programs and events that provide networking opportunities as well as encourage the professional advancement of our members. One of our programs includes monthly seminars that will provide the opportunity for our members to present industry related topics of their choice. The seminars will provide a platform for experienced Tamil Professionals to present their knowledge to the audience, while the audience will benefit by listening to the experiences of the speakers. TMPA’s kick-off event will be it's first annual gala this spring entitled, ‘Thulir’, meaning to sprout or blossom. The gala will be held on Friday, April 20th, 2018 at the Scarborough Convention Centre. All professionals working in the industry including validation scientists, quality assurance associates, research associates, chemists, regulatory affairs specialists, clinical research associates and project managers -are welcome to bring their business cards and enjoy an evening of networking and key-note talks from experienced leaders in the field. The night will showcase and celebrate the leadership and achievements of Tamil Professionals in the Medical Device and Pharmaceutical Industry. One of the esteemed speakers at Thulir will be Dr. Thas Yuwaraj, Director of Quality Assurance, Regulatory & Clinical Affairs, and IP at Synaptive Medical, a Canadian based growth-stage medical device company located in Toronto. Dr. Thas, a first generation Canadian, holds a doctoral degree in biomedical engineering from The University of Toronto’s Department of Electrical and Computer Engineering. After working as a staff scientist at Bayer Diagnostics, Thas transitioned to management roles where he currently helps early stage medical device companies with product development and regulatory strategies for approving the device in the United States (FDA), Canada (Health Canada) and Europe (EMA). Thulir will also gift two scholarship awards to University graduates from the field of Science and Engineering, who are continuing to complete a Master’s Degree or post graduate certification in the same disciple. The students must have excelled in academics and demonstrated leadership qualities in becoming a future leader of the Tamil community. If you would like to nominate yourself or someone you know, please visit the TMPA website: http://tamilmedicalpharma.com and complete the application. Let’s continue our mantra and promote the advancement and growth of the Tamil Community in Canada. For tickets to Thulir please visit: https://www.eventbrite.ca/e/thulir-annual-dinner-gala-tickets-42135766211?aff=ehomecard. To become a volunteer for TMPA please contact us via LinkedIn or Facebook.